VETERANS DAY, 2016--They were a band of brothers, a tiny one, but proud. The ranks of military aviation have remained overwhelmingly white for decades. With the exception of the famed fighter pilots of World War II known as the Tuskegee Airmen, a unique unit of black pilots in a segregated force, very few aviators in the Army, Navy, Air Force and Marines were nonwhite. That is still true. There were some efforts to change that by recruiting more volunteers from predominantly black schools and neighborhoods. The military newspaper Stars and Stripes reported in 2003 that African-Americans made up 13 percent of the U.S. population, 20 percent of its military, but barely 2 percent of its Navy and Air Force pilots. That segment probably is even smaller now, since recruiting efforts have declined with the withdrawal of American forces from foreign battlefields. "We were a band of brothers," said Clyde Romero, one of four African-American helicopter pilots who served together in Vietnam as part of a distinguished, gung-ho air cavalry unit: C Troop, 2/17 Cavalry, 101st Airborne Division. 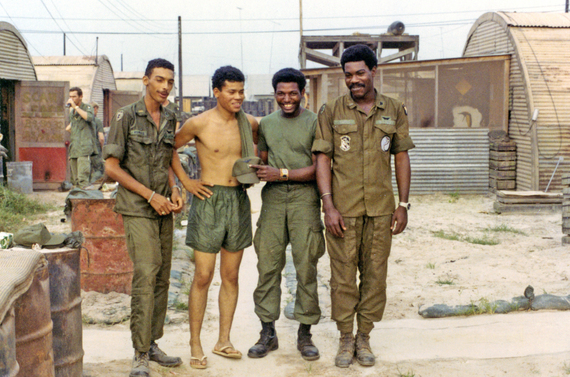 C Troop, known as the Condors, very likely was the only unit of its size in Vietnam with four black pilots. Remarkably, three of the four black Condors--Romero, Eldridge Johnson of Little Rock, Ark. ; and Robert Farris of Yadon, Pa.--left the Army after their tours in Vietnam, joined the Air Force, won commissions and became fixed-wing pilots. When they retired from the military, all three veterans piloted commercial airliners for major carriers and have kept in touch for more than four decades. The fourth person in their small band, shown shirtless in a photo taken at their troop's headquarters at Phu Bai, South Vietnam in 1971, was Warrant Officer 2 James Casher, who was shot down and wounded in Laos but was rescued, recovered from his wounds and returned to his unit. He earned a Silver Star, the nation's third highest award for combat valor, flying a Cobra helicopter gunship in Vietnam's notorious A Shau Valley. Casher finished his tour and went home, supposedly to go to medical school when his military hitch was up. Instead, he disappeared for three decades, until his former comrades found him, living in the woods outside a small town in Washington state. He was staying in a detritus-jammed, one-room shack, surrounded by about a dozen mongrel dogs. Not until after his death from chronic dehydration in 2011, did longtime residents of the area learn that Casher was not just a Vietnam veteran but had once been a medal-bedecked war hero.